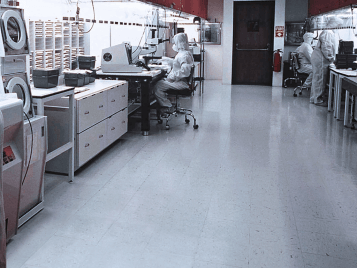 In cleanroom environments in the pharmaceutical, life sciences and manufacturing industries, airborne particles can be a major source of contamination. Not only can they cause yield loss, the particles can also lead to corrosion and product degradation. ISO standards and cGMP regulations for air purity require you to comply by presenting consistent results that can be verified on a regular basis. Colorex can help here. Suitable products are Colorex SD, Colorex EC and Colorex EC plus. The CSM qualification, which defines the suitability of Colorex EC for a specific cleanroom class, based on particle release and outgassing behaviour. This is the main qualification, typically dedicated to front-end semiconductor manufacturing but also to pharmaceutical cleanrooms. The TESTED DEVICE certification, where the action of chemical and biological stresses on Colorex EC, as well as its decontamination capabilities, have been assessed. This test series will be typically dedicated to the pharmaceutical industry, to life science applications and to healthcare in general. 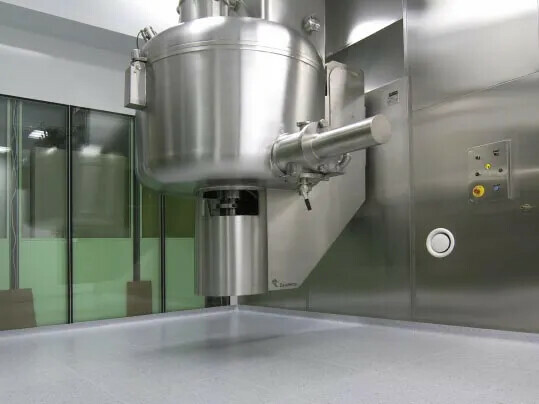 CSM stands for Cleanroom Suitable Materials. CSM is an industry alliance that was initiated by the Fraunhofer IPA institute in 2003. The CSM alliance develops testing methods based on international standards dedicated to assess and validate the cleanroom suitability of anything that is used or is entering a cleanroom environment. Today, some 30 leading names of the contamination control industry worldwide are part of the alliance. 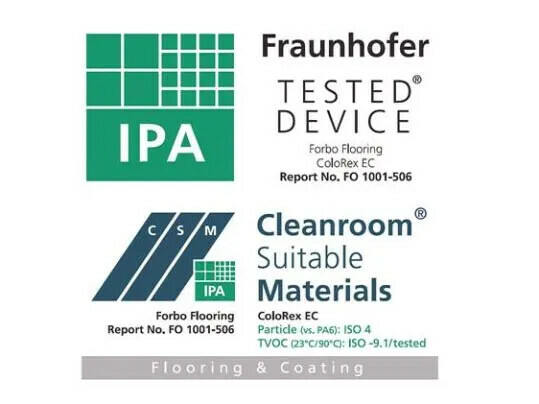 Forbo Flooring joined the CSM alliance in 2009. Particle release of Colorex EC under frictional stress is compliant with the air cleanliness requirements of ISO class 4 cleanrooms according to ISO 14644-1. Emissions of TVOC at 23° C are not exceeding the limiting values for ISO-AMC Class -9.1 according to ISO 14644-8. Upon the results of the micro-organisms adhesion test by Fraunhofer method, Colorex EC proved suitable for use in pharmaceutical grade A and B zones according to the EC-GMP Annex 1. Biological resistance (action of micro-organisms) of Colorex EC was tested according to ISO 846. Growth intensity under microscopic inspection was 0, proving that the material is not a nutrient for micro-organisms and that it is therefore inert and fungistatic. The surface cleanability was rated according to the German VDI guideline 2083 Part 9.1. The surface cleaning success obtained and correlated to this standard, places Colorex EC between Surface Cleanliness Class 1 and 10 on a scale going from 0.1 (best) to 1000 (worst). The chemical resistance of Colorex EC against 14 selected chemicals was tested by immersion according to ISO 2812-1. The selected chemicals are those mostly present in surface cleaning agents, disinfecting products and bio-decontamination procedures. Complete test results and explanations can be found in our Cleanroom Suitability Certifications leaflet which can be downloaded using the link on the right.